Thousands of New York City children do not have access to a park or playground within a ten minute walk of home. In fact, 73 percent of the city’s low-income neighborhoods fail to meet the city’s standard of 2.5 acres of parkland per 1,000 residents. In these communities, many of the schools have no playground facilities at all. This scarcity of outdoor play opportunities contributes to high rates of childhood obesity, diabetes, asthma, and other health problems. Since 1996, The Trust for Public Land has helped design 200 playgrounds in New York City public schools. We transform barren asphalt lots into vibrant playgrounds with safe and durable play equipment, athletic facilities, gardens, and opportunities for environmental education. 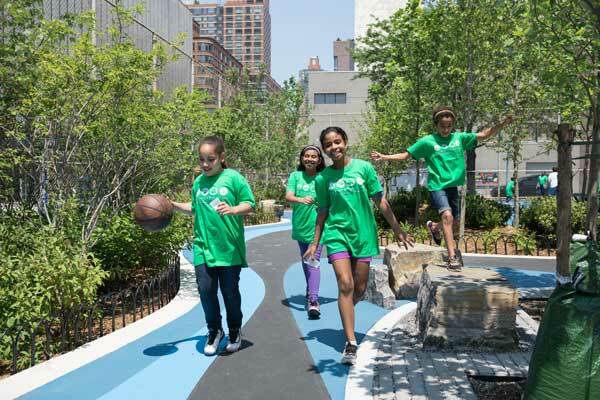 Our partnership with New York City has resulted in more than 160 acres of additional playground space serving nearly 4 million New Yorkers who live within a 10-minute walk of one of our sites. That's more than half the population of New York City! When designed well, playgrounds are a cost-effective approach to improving air quality, cooling the city, and protecting vital waterways. We equip our playgrounds with green infrastructure elements—such as rain gardens, porous paving material, and specially selected plantings—that reduce excess stormwater and sewer overflows that pollute New York City’s rivers and harbor. In the next three years, we'll continue to work with our valued public and private partners to create new playgrounds in park-needy neighborhoods across the five boroughs. We rely on vital public partnerships with New York State, NYC’s Office of Recovery and Resiliency, the Department of Environmental Protection, Department of Education, the School Construction Authority, and New York City elected officials. The private funders essential to our mission include New York Road Runners, MetLife Foundation, and our Playgrounds Committee. Will new ways to play change our city parks?